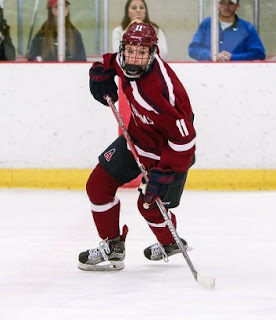 As expected, BU’s star freshman Clayton Keller has signed an entry-level contract with the Arizona Coyotes who had made him their first draft choice and 7th overall in last June’s Entry Draft. Shortly after BU returned to Boston early Sunday morning, Keller, who led BU in scoring with 45 points (21G, 24A), flew to St. Louis (the Coyotes’ next stop on a road trip). He led the team’s Sunday practice and made his NHL debut last night. A native of nearby Swansea, Illinois, Keller recorded 14 minutes of ice time in Arizona’s 4-1 loss to the Blues. A number of reports indicate that sophomore Charlie McAvoy's advisor is discussing an ATO contract with the Bruins that might have him suiting up next weekend for the AHL Providence Bruins, where his former BU defense partner, Matt Grzelcyk, is in his first pro season. Following the NCAA Regionals, the Terriers remained at #6 in the USA Today/USA Hockey Magazine poll. In both the RPI and KRACH ratings, BU is ranked #5. 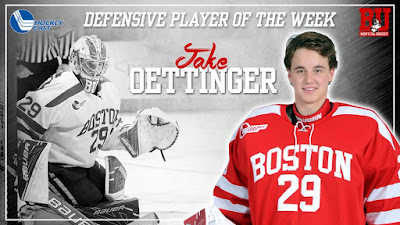 Freshman Jake Oettinger, who stopped 56 pucks against North Dakota and another 20 against Duluth, was named Hockey East Defensive Player of the Week. It was the third time Oettinger earned DPOW honors. A two-time Rookie of the Week, he was named to Hockey East’s All-Rookie team and was selected as a Hockey East Second Team All-Star. McAvoy, who scored the game-winner against North Dakota, and Patrick Harper, who had two assists in the semifinal win and the tying goal against Duluth, were named to the weekly top performers list. 2017 NTDP Evaluation Camp in Plymouth, Michigan today and SB Nation’s Jeff Cox offers his thoughts on the 45 invitees, who included six future Terriers. He ranked 2020 recruit Trevor Zegras (photo, Avon Old Farms) as the top forward in the group and 2019 recruit Case McCarthy as the #3 defenseman. With two assists in Buffalo’s 4-2 win against Florida, Jack Eichel reached the point-per-game mark with 55 points in 55 games.